Proper winter care is key for beautiful roses in the spring and summer! 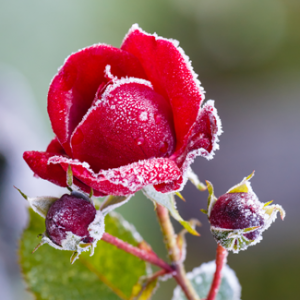 It is important to diligently care for your roses all year long, especially in the winter. Whether you live in New England, the deep South, the Midwest, or the West Coast – it is essential to prepare your rose garden for the cold winter months. Your garden most likely does not see or produce much activity during the winter, but there are still things happening under the soil! Some areas will see harsh winter weather such as heavy snow, and others will see only slightly frigid temperatures and possibly a frost or two. Snow can both protect plants AND cause damage to them. A heavy snowfall can insulate the soil like a mulch, but it can also pile up on branches which can weigh them down and can cause them to break. If your garden experiences a heavy snowfall it is important to remove the snow from the branches of your plants and trees. As you know, winter is also the time to remove all dead leaves and prune the weak/diseased canes at the base. This will help your roses grow to their full potential come spring. Be sure to use high quality pruners that snip the canes easily – like the PowerGear® Large Pruners. 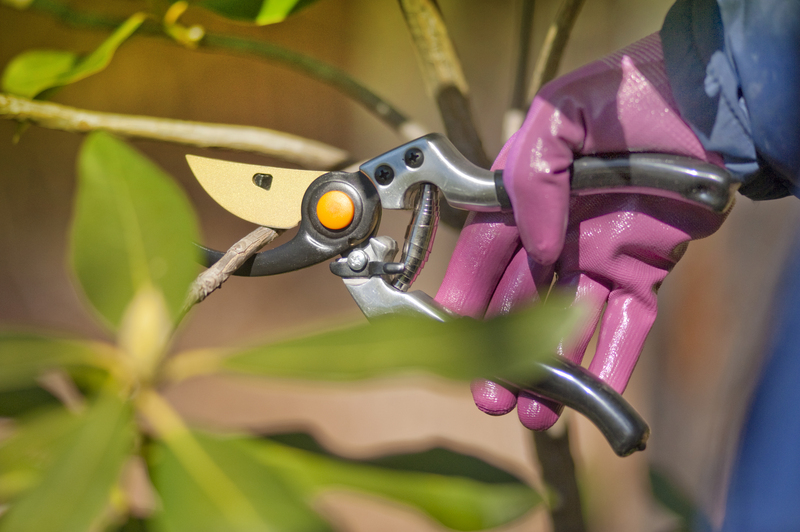 Pruning your shrubs and canes before winter is essential. Hopefully, you stopped fertilizing and pruning your rose garden before winter began. You do not want the rose bush to continue growing when the first freeze comes around as it can kill the plant. Essentially, you want to encourage your rose plants to go to “sleep” for the winter months. Once you get the first freeze or frost in your area the bushes should go dormant (depending on what zone you live in). The colder weather does not mean you do not have to water your roses! Watering your roses is still important during the winter months. Even if your area does not normally get snow or ice, cold wind and air can pull moisture out of the rose’s canes – meaning the soil moisture can also be depleted. Check your soil on a warmer day and give it a light watering if it’s needed – do not soak. You may ask, what about my climbing and container roses? If the climbers you planted are zone-hardy, they should be able to survive the winter with the same protection that you give your other roses. Pruning for the winter is key for climbers to protect them from the cold wind. If you feel that they need extra protection, you can wrap the canes in burlap and tie it securely. For your container roses, you can bring them inside if you are able or want to. If you have a garage or shed, you can winter your container roses there – just remember to water them occasionally to keep the roots moist. 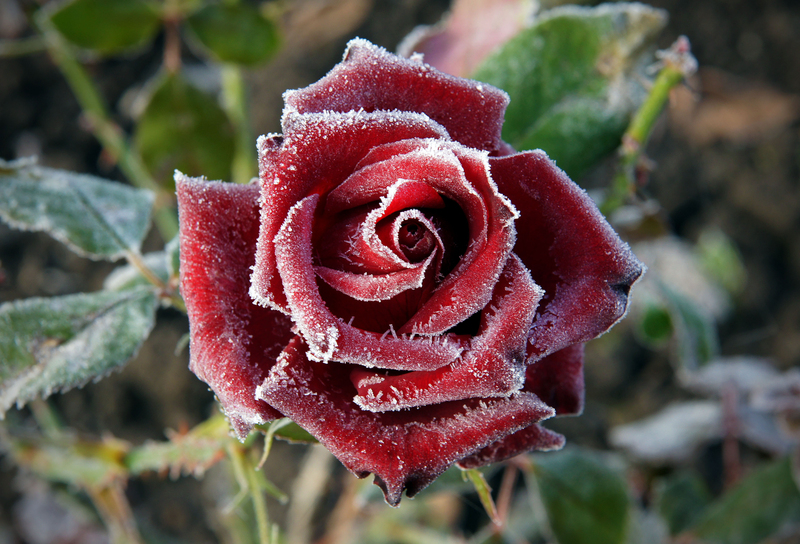 For more information on winter care for roses, visit our website here. Once the snow and chill of winter start to melt away, you can look forward to a wonderful rose season! Your roses will thank you. 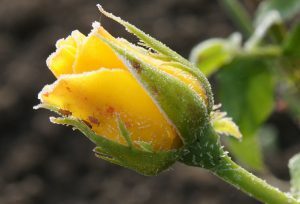 Young yellow rose with aphids in the frosty morning.